Peace is like a seed that sows charity. In your peace garden, flowers of love and compassion spring up in warmth and light. Love and compassion in turn give glory to God by building the Kingdom on Earth. If you spread these seeds of peace, scatter them wherever you go, you can accomplish this remarkable feat. You create a home of peace, a city of peace and eventually a world of peace. Impossible? Not really. Gardeners know the winds scatter weeds across the fields; why couldn’t the winds spread seeds of charity, calm and tranquility? If you act upon your dreams and your prayers, your homes become houses of hospitality. Begin small—at home. When troubled, recover your calm and composure. Your practice of calmness will spill over daily in your thoughts, at your work, and in all of your daily experiences. Yes, your homes shall be houses of peace. Your homes become a welcoming presence for God. Your entire family may become “walking tabernacles” in the cities of God. It is spring! Plant gardens of calm and tranquility. Spread seeds of love and compassion. Many will come to your garden and leave with bouquets of flowers of peace. Peace, calm and tranquility be to all. Amen. Ponder the poem. Take time to tell your troubles to Jesus your friend. How do you calm yourself so anger doesn’t take over your composure? How do you help your children to divert anger? What is one thing you prefer to do for another to make this world a little more peaceful? Have you at any time experienced the coexistence of faith and questioning? Why is questioning your faith useful in your faith journey? Activity: Make and tend a peace garden. 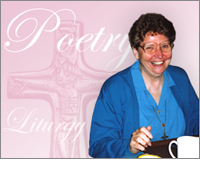 Thank you, Sr. Juliemarie, for sharing this beautiful poem!! I need to do my ‘weeding of the soul’. My laxidasy attitude attributes to the weeds. Another thought provoking and soul searching piece. Thank you Sr. Juliemarie!